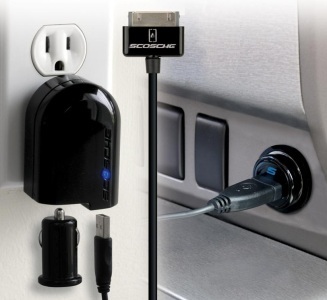 Scosche (makers of various home and vehicle accessories) just announced a product that I think I’m going to have to pick up. It’s a USB charger that works in the home and the car, you plug your device into the adapter and then into the wall mounted charger, or into your 12v cigarette lighter socket in your car, and voila! Instant power source. There’s three different levels of the product available, a plain socket adapter for $19.99, a house adapter that you can charge two devices with (and it has the 12v adapter as) well for $44.99. There’s also a 12v socket adapter with an iPod cable included for $24.99, if you need a cable to leave in your car.